I'd like to thank the people who have emailed me with both praise and thanks for the work I am doing. I do appreciate the encouragement and recommendations....it keeps the project exciting and worthwhile. So...thank you. A special thanks to my family and friends as well as encouragement and linking recommendations from Ranger John Hoptak (author of the definitive history of the 48th PVI on his unbelievable website 48thpennsylvania.blogspot.com), Dave Derbes (President of the Historical Society of Schuylkill County www.schuylkillhistory.org) and Stu Richards (Author of the long running website schuylkillcountymilitaryhistory.blogspot.com ). I recommend following these websites for stories, musings, historical information, and entertainment. Some of the interesting artifacts you find while doing primary and ancillary research for a project such as this are not only the supporting data for your story, but the roadblocks and erroneous information that you find. People make mistakes, and records are kept in error as a result of those mistakes. I guess it could frustrate the amateur researchers such as myself, but in reality, I find it rather interesting and fun. I like finding these little "nuggets" of fact and error....it keeps the work engaging. Last week, while researching a letter that JWD wrote in April of 1862, he made a reference to John H. Derr. Though I haven't fleshed this out yet, I assume that most of the Derr's in the Deep Creek area around where JWD lived were related in some way. Census Records for the Barry Township area only show Derr's in the area around 1830, or so, and before that time in the 1820 Census Records, there is no mention of the Derr's. In discussions with my father, he remembers our relatives saying that the family moved from the Philadelphia area to Schuylkill county around the 1830s. So, I will use that as a reference point as well as a rationale for why I think the JWD and John H. Derr were somehow related. I suspect they were cousins. 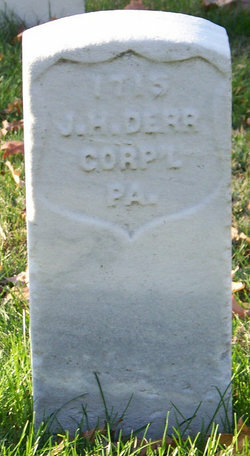 John H. Derr was a Corporal in Company D of the 48th and was a superior to JWD. In prior blogs, I mentioned the pension affidavit of Levi Derr, JWD's cousin, also a Corporal in Company D of the 48th. So, I believe that John had two cousins who were in his company serving as Corporals. While doing research, I saw that John H. Derr died on January 2nd, 1863 and was buried in Washington, DC at what was called, the Military Asylum Cemetery (now called the Old Soldiers Home National Cemetery). It is located on the grounds of the Old Soldiers Home in Washington DC, the same location that houses the summer cottage frequented by President Lincoln during hot and humid summer months in Washington. This cemetery was one of the first used by the country during the war and is has over 14,000 union dead buried there. Well....John W. Derr did not die in 1863 and was not a Corporal as this card indicates....Also, you'll see the references to the death date, death location, and the reference to his "Rolls give initial: H". Also, in JWD's discharge papers his description is closer to that referenced in the card below....his height being 5' 8" not 5' 11". Also notice the remarks regarding his re-enlistment at Tennessee in 1864. Headstone of John H. Derr at the Old Soldiers Home National Cemetery, Washington, DC. Headstone of John W. Derr at St John's (Kimmel's) Cemetery, Barry, Pennsylvania. I will come back to this story sometime in the future as I have decided that I would like to go to the gravesite of John H. Derr here in the Washington DC area. I suspect that after he died and was buried here, that there is little chance that his family had the time, money or transportation to get to Washington, DC. I think it would be fitting and respectful to be the first relative to visit his final resting place, nearly 150 years after his death in the service of his country.